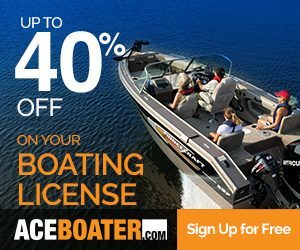 I met David Coursol on a terrace after a big enduro day. People introduced us and I realized he was the guy offering the night’s big prize: a 12-day motorcycle tour of Guatemala. 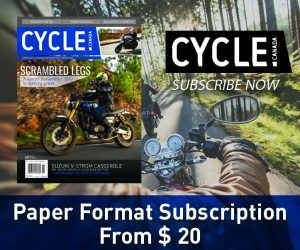 This French-Canadian motorcyclist and traveller was there to present his motorcycle adventures business. 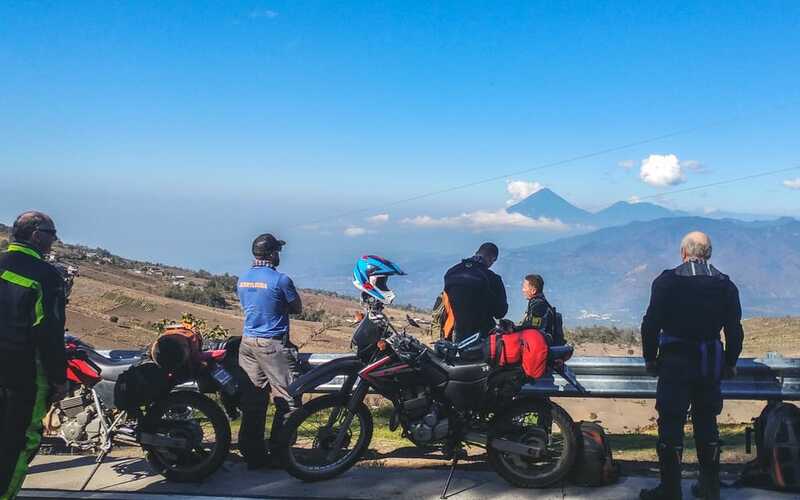 For the last six years, Motorcycle Adventure Guatemala (or MAGtours for Social Networks) has been offering motorcycle trips on Guatemala’s backcountry roads. It would be difficult to get a better insight into the real life of the Guatemalan communities than by visiting the smallest mountain villages with his group. 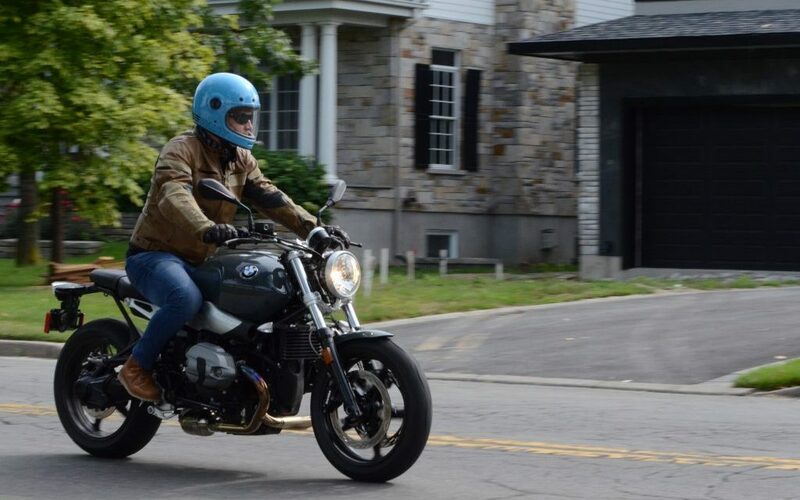 David and his American business partner Evan Fell were globetrotters eager for adventure and challenges when they met in Antigua, Guatemala. Evan is an enduro buff who managed websites and social media outlets and David worked as a general manager for a motorcycle dealer. 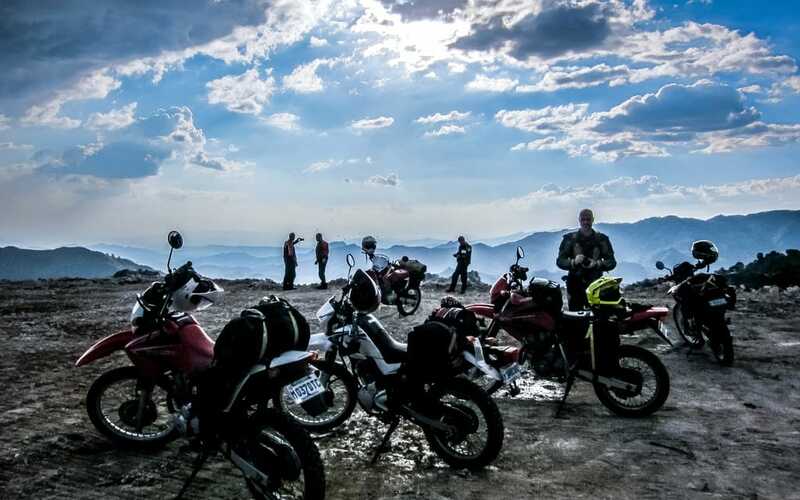 One evening over a beer (Gallo or Brava, practically the only two brands available there) they decided to go into business and map their own motorcycle tours on the backroads of their adopted country. 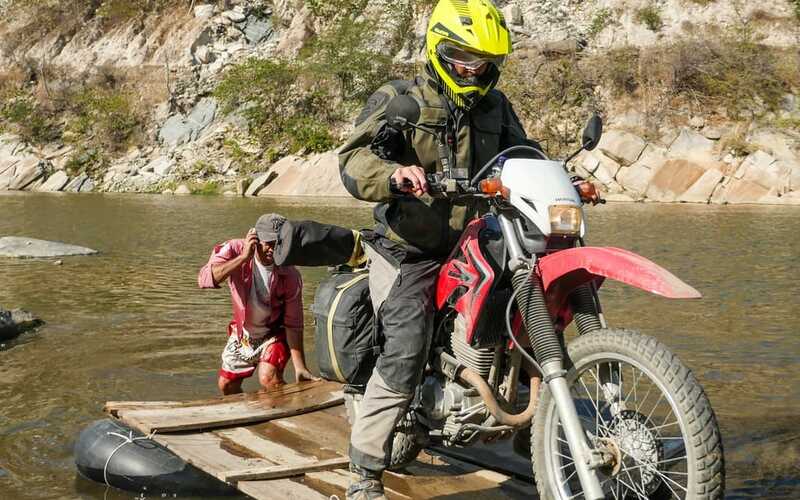 They rode for thousands of kilometres on the dusty roads of Guatemala to find the best routes leading to hotels offering local flavour and acceptable conditions for our cozy North American tastes. For months, they travelled unknown routes to plan interesting itineraries. 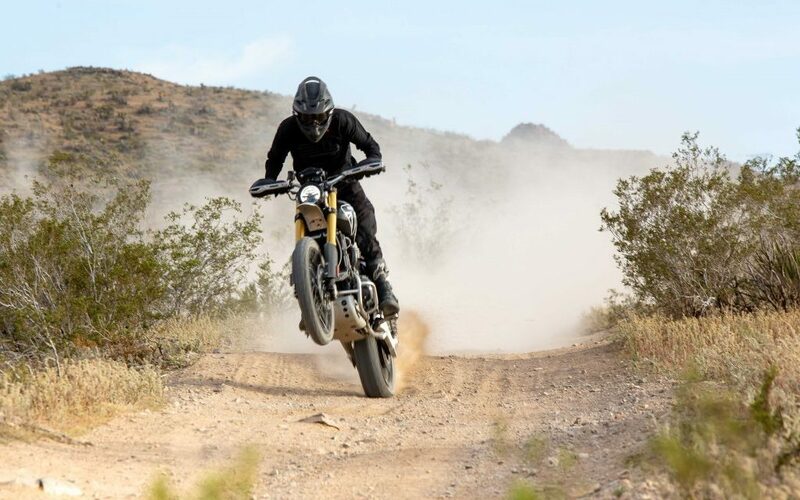 They focused on showing their riders different sceneries and offering challenges for motorcyclists of all levels. They also made a smart decision to plan their itineraries in time rather than kilometres. 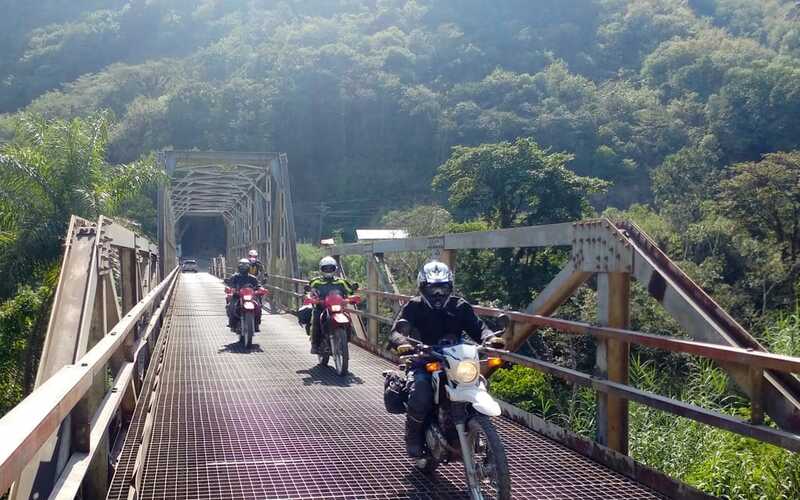 Here in Central America topography, bad roads, and heavy, unpredictable traffic all take their toll on a day’s ride. After a short transit under the smog-cloud of Mexico City, my travel partner Philippe and I landed in the overwhelming heat of Guatemala City. David was waiting for us with his little MAG tours sign. We put our bags in his van and we plunged into the traffic of this small capital of 1-million inhabitants. All our senses were immediately assaulted. Our ears by the horns of a thousand frustrated drivers, our noses by the diesel engines spitting their enormous black fumes (anti-pollution systems are optional) and our eyes were wide open to see all the colourful old public transport buses intertwining with outdated cars and brand new Beemers and Hummers. With its functional chaos, Guatemala City gave us a concentrated mix of what was waiting for us. Arriving in Antigua, we meet Evans, Yves, and Jake, our riding partners for the 12 days on the road. Bad weather made Blake miss his connection and he will join us the next day. 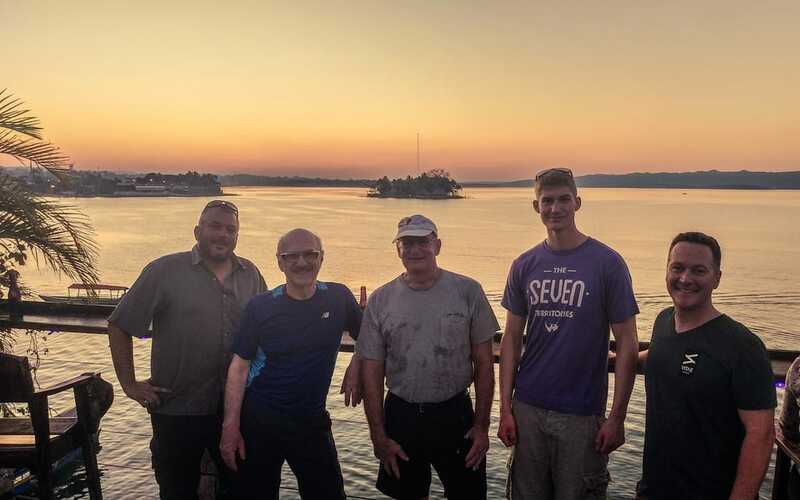 At 72, Yves will be the most senior of the group, this denturologist and part-time maple syrup producer from Mont-Laurier, Quebec, hiked his way here 50 years ago and he looks forward to seeing the evolution of this small, forgotten country. Jake is from Grand Rapids, Michigan. 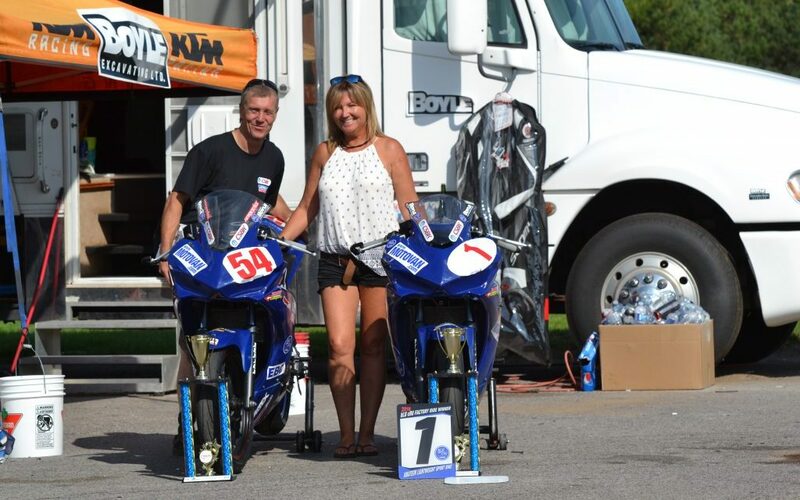 This CFO loves to ride and makes a long motorcycle trip nearly every year. After his last trip to Patagonia, he chose Guatemala for the change of scenery and the adventure. 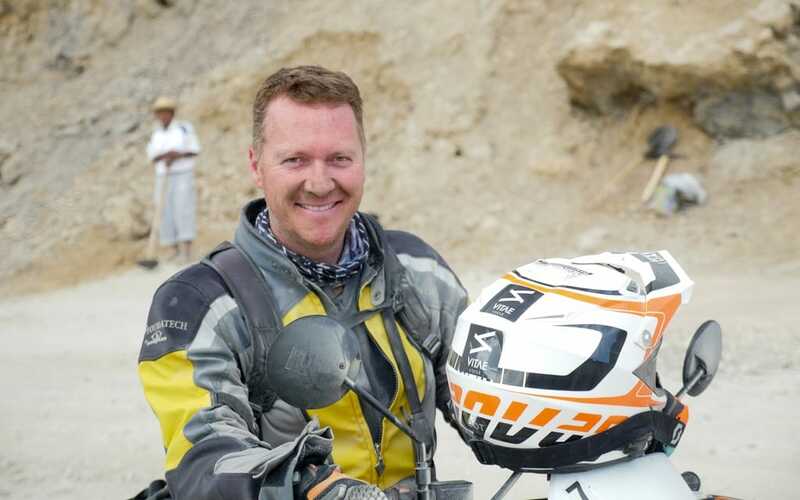 Philippe is a motorcycle police officer and weekend enduro rider and this is a first motorcycle trip abroad for him. 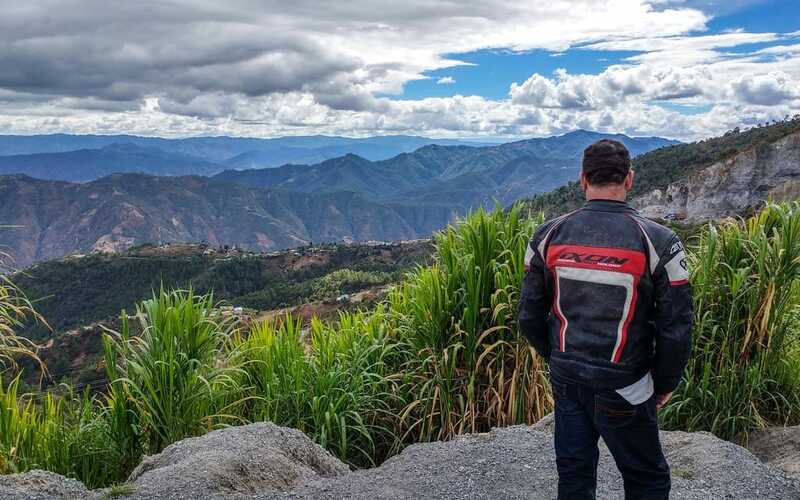 The next morning, after safety instructions and a summary of the road ahead, David and Evan take us along the winding roads of the surrounding mountains for a short day of riding and visiting popular sites around Antigua. In the distance you can see the volcanoes surrounding this charming little tourist town. 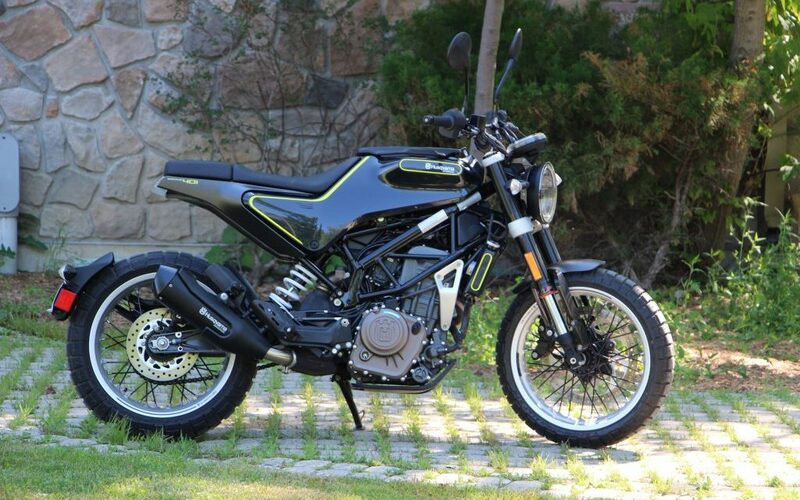 This is also the time to familiarize ourselves with our small Honda XR 250 Tornados. 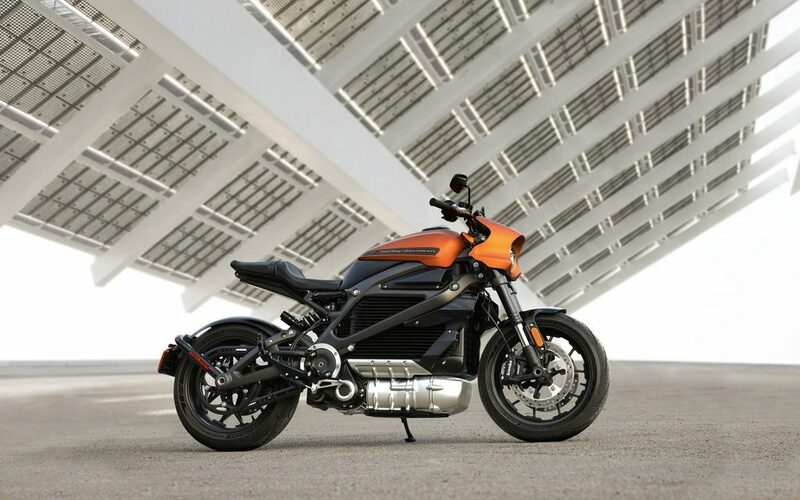 These small, reliable, and user-friendly motorcycles are easy to handle and offer the right combination of comfort, manoeuvrability and fuel economy for this kind of journey. After a short hour of riding, we visit our first public market. We park our bikes away from the buzzing marketplace and we blend in with the crowd while our guides stay with the equipment. What strikes me first is the size of the people here. At five feet ten, I feel like Shaquille O’Neil. Guatemalans are direct descendants of the Mayans and the average size here is probably around five-two. As we are in a market rarely visited by foreigners, the timid character of the Guatemalans leads them to look at us only stealthily or even to avoid our gaze. It’s like we are ghosts passing by. We visit a family-owned chocolate factory and we enjoy some good, old-fashioned hot chocolate with cardamom accents. While we’re sipping, David suggests visiting a garage that converts old buses into chicken buses. We discover the second life of our old Girardin buses after we spoiled North Americans toss them out for the crime of getting old. Here, they are pimped with chrome and bright colours and used for cheap public transport. The next morning is the first real riding day. We head out early for Lake Attitlan in the mountains of the Sierra Madre. We cross a river on a road that shifts from excellent to very bad. The mountain twisties are a delight and we barely see any cars or trucks all day. The magnificent lake reveals itself around a corner and we immediately stop roadside to enjoy the view. Attitlan Lake is located 1,562 metres above sea level and covers 130 square kilometres. At 350 metres, it is also the deepest lake in Central America. Its blue waters are bordered to the south by three volcanoes, among them the Attitlan, which rises to 3,537 metres. 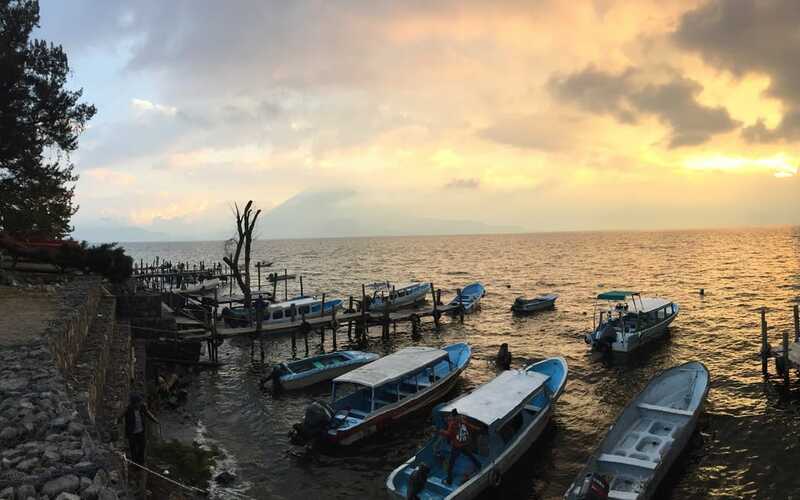 After a short boat trip on the lake, we spend the night in Panajachel, the touristy capital of the lake. 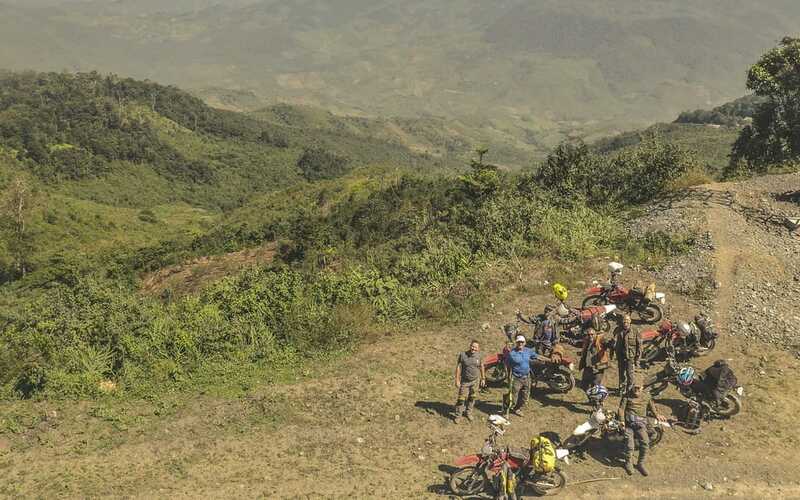 In the early morning, our guides explain that the day will mostly be spent riding on asphalt, but that in “Guate” the definition of asphalt is quite broad. Let’s say that potholes are ubiquitous and it is impossible to avoid them all. We head out to the city with the most swinging name I’ve ever heard: Chichicastenango. If you repeat it over and over quickly, it sounds like the lyrics to a Gypsy Kings song. 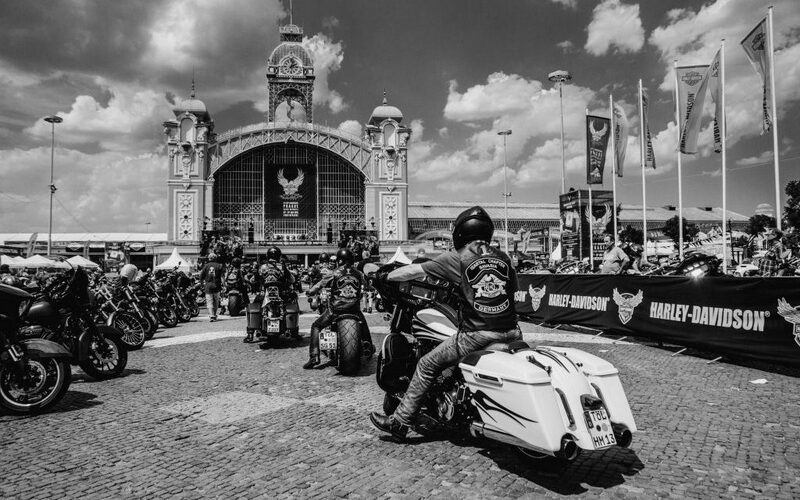 Arriving in town, we leave our motorcycles in a large parking lot and cross the chaotic traffic to dive into the heart of the largest market of the region. This one is very different from the first market we saw. The odours of dried fish mingle with those of fresh fish. A man boasts the merits of the perfume he is selling on a wooden tray. The hot sun penetrates the market and bounces off the tables filled with bright statuettes, cheap jewellery, foods, spices, and scarves. The smoking barbecues where old women in traditional costumes prepare all kinds of food are installed right on the edges of the aisles. We hit the road again and get to an isolated cheese factory. They offer charming little cabins on this farm located in the heart of a hidden valley. The place is extraordinary and we are forced to stop to enjoy the views and the joy of being here. The waitresses at the restaurant are women from the small village down the hill and their simplicity, good tempers, and kindness are obvious despite the language barrier. David entertains all of us by making the women chuckle. After a long day’s ride and a few beers, the laughs are easy and we all go to bed with smiles. 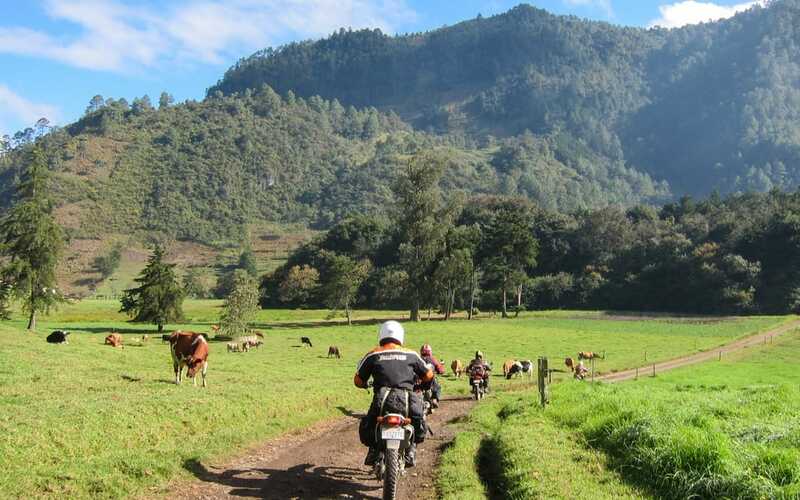 The city of Coban will be our next destination but to get there we will have a serious riding day. Mostly on unpaved roads, we travel in a cloud of dust forcing us to keep our distance from each other and from the numerous trucks and buses on the road. The sight of the landslide which took away a mountain side a dozen years ago is striking. Curiously, just when we think we are literally in the middle of nowhere, we see people walking by on the road. Every 10–20 kilometres we cross tiny villages of five to 15 houses. What they are doing there and why people stay there is a mystery. The road alternates between very bad and passable and we have to stay up on the footpegs all day to spare our backs. That evening, the modern Coban Convention Center hotel is a happy retreat. The hot shower manages to remove the dust from all our orifices and we enjoy a good dinner. The fresh temperature of the high altitude air gives way to crushing heat as we approach the lowlands of Peten. We arrive in popular Flores dusty again and the fifth floor hotel room wrings out the last drops of energy I have left. Fortunately, cold Brahva restores everything. 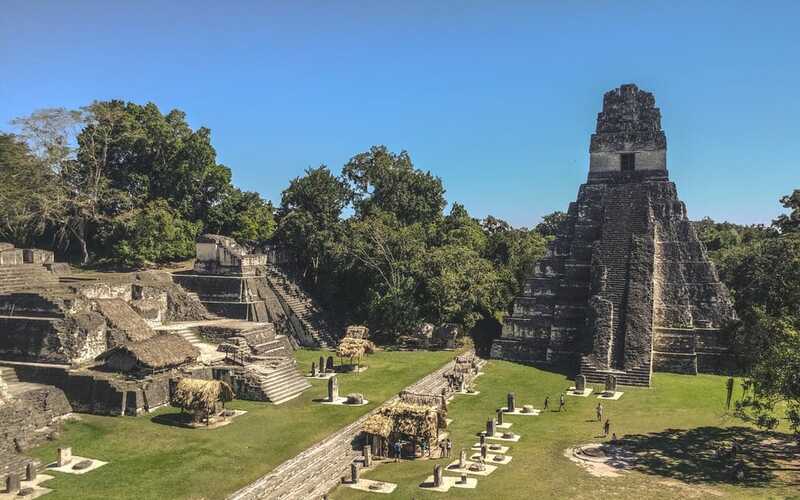 We visit the ruins of Tikal on our day off. The rest is appreciated by all but by next morning we are all eager to get back on the road. The charming Rio Dulce welcomes us with its Spanish fort and the lodge located in the jungle is absolutely charming. Again, the benefits of using a guiding service are obvious. Without them, finding all these roads and these unique accommodations would be quite a bit more complicated. 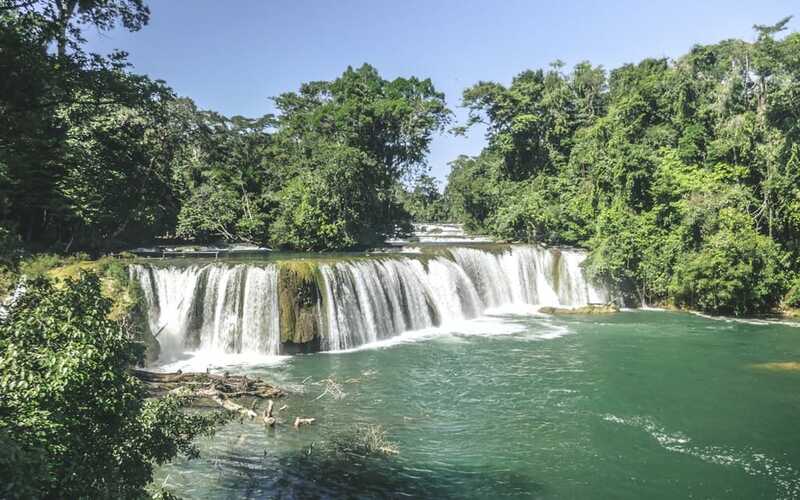 Our return to Antigua takes three days and winds through the Semuc Champey area with its beautiful falls. Halfway to Antigua and 24 hours before taking our return flight, we are stuck in a roadblock. Government workers blocked the road to protest the backlog of their pay. No way to pass and tracking back would require us to make an eight-hour detour! Our guides consult each other, stop to chat with residents and manage to find a mountain pass that will take us back on the right path. The detour leads us through isolated valleys where children in schoolyards wave at us. Traffic here is scarce and workers on hill plantations stop to watch us pass by. David is focused on closing the loop but as the rest of us aren’t too aware of exactly where we are, we are delighted by this detour. After an hour and a half of zig zagging, we finally arrive at a familiar crossroads for David. 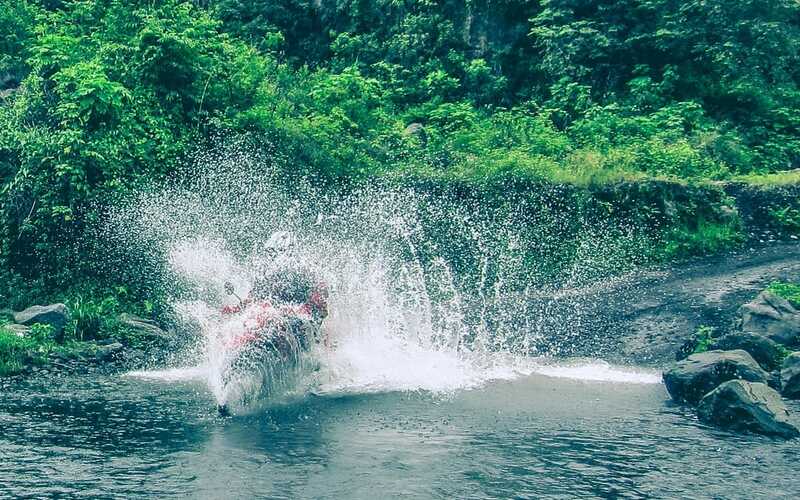 The following river crossing is quite an experience. The iron bridge that used to cross the river fell during a storm 12 years ago and it has never been put back. Looking at the old bridge rusting still on the river side David says he uses the expression #guatemala for describing the incongruities of this country. This is definitely #guatemala. Necessity is the mother of invention and a local peasant built a makeshift platform made out of four tire tubes and two sheets of plywood held together by a big rope. 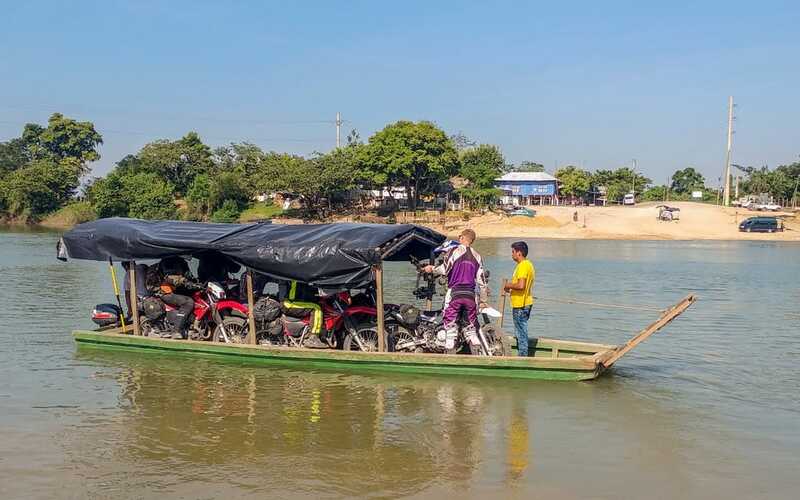 We have to get on that thing one by one with our motorcycles and the man pushes it across the knee-deep waters of the river. At U$ 2.50 each, it’s a cheap thrill. I come home with a multitude of images in my head: the beauty of the valleys, mountains and volcanoes, the heat of the Peten, the clouds of dust, the beauty of the rivers, the overwhelming poverty and the smiles, screams and whistles of the children greeting us when we pass through their villages. In a poor country, wealth is elsewhere. It is in the character of the inhabitants, the resilience of the peasants and the wild beauty of untamed nature.